last fall at Saratoga High School. 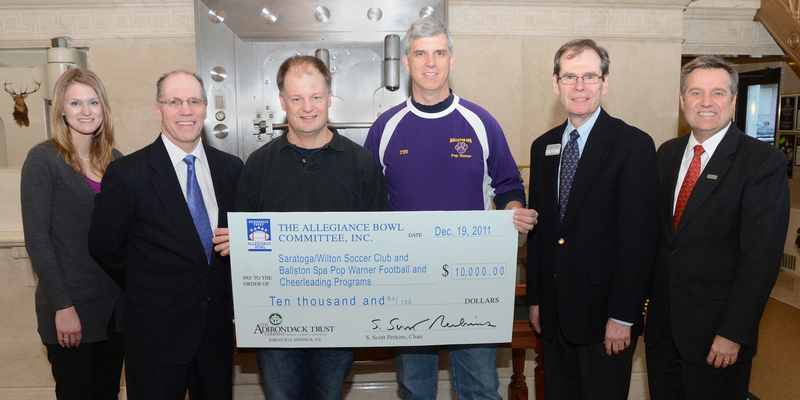 “We are extremely pleased that the community turned out to support this charity event and its beneficiaries, Saratoga-Wilton Soccer Club and Ballston Spa Pop Warner football and cheerleading,” said Scott Perkins, Allegiance Bowl Committee chairman. “The proceeds from the event will assist these two programs in their mission to offer children the opportunity to participate in competitive youth sports while developing character and confidence through team play,” he said. The Allegiance Bowl is made possible by the continuous support of the organizing committee and its primary sponsors: The Adirondack Trust Co., The Saratogian and Star Radio 101.3. Former Saratoga Springs High School, University of Notre Dame, and NFL player Anthony Weaver was the event’s honorary chairman. To date, the Allegiance Bowl has raised over $60,000 for youth athletic programs in the greater Saratoga Springs area. Sprint football is regulation, varsity-level tackle football with one exception; no player may weigh more than 172 pounds three days prior to game day. Teams competing in the Collegiate Sprint Football League include Cornell, Mansfield University, Penn, Post University, Franklin Pierce University, Princeton, Army, and Navy. For more information, visit the bowl game’s web site at www.allegiancebowl.com.